Five tier cupcake tower filled with personalised cupcakes to match any colour scheme or theme. View our cupcake tower gallery. 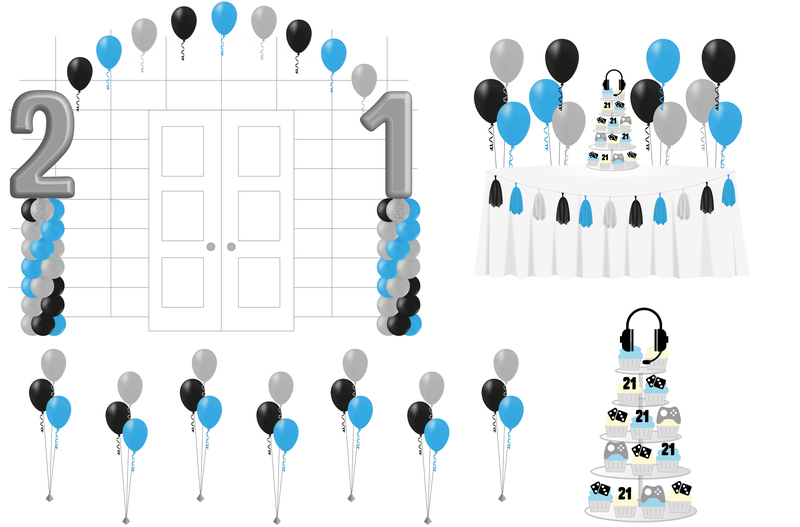 X2 Large foil balloon numbers on columns with connecting arch for entraceway/dance floor etc. X2 Balloon clouds/pom poms topiary either side of cake table. X7 Table top balloon bouquets in matching colours. Cake table decorated with tablecloth, runner and hand made tassel garland. 5 Tier cupcake tower filled with personalised cupcakes to match any colour scheme or theme. View our cupcake tower gallery for inspiration.